Devices with “smart” technology these aren’t only our phones. It seems as if everything from watches to toothbrushes are integrating intelligent tech into its design. This holds true for a multitude of home gadgets, too. More and more systems for total home automation — from temperature control to home-monitoring and security — appear on the market every day. This holiday season, upgrade your home to the 21st century with a few of these remarkable, futuristic products. We’ve compiled a list of smart home gadgets that makes “clap on, clap off” look like technology from the Stone Age — perfect gift ideas for your tech-savvy friends and family members. You’re probably familiar with the Roomba, but the floor-cleaning robot’s big brother, Scooba, takes futuristic housekeeping to the next level. Scooba features a simplified design, longer battery life and a four-stage cleaning process that never reuses old, dirty water. There’s no sweeping required beforehand, and the machine will do all the scrubbing and squeegeeing over your entire floor without you having to lift a finger. The process removes up to 98% of common household bacteria. Price: $499.99. Power strips are one way to streamline your home tech setups, but they can be cumbersome and difficult to access when hidden behind entertainment systems or under the bed. The Pivot Power Genius tackles these problems with a bendable frame that will fit any sized plug or adapter — you won’t waste a single outlet. Two of the outlets in the power strip are app-enabled, so you can sync them with your smartphone and wirelessly control the devices that plug into them for literal power at your fingertips. Perfect for the days when you think you may have left the hair straightener on. 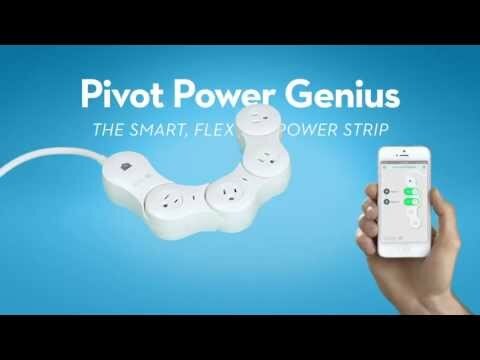 Pivot Power Genius is available at Quirky.com and The Home Depot. Price: $79.99. Goji is a successfully funded Indiegogo project that aims to make your home security a little smarter. Goji smart locks send real-time picture alerts to your mobile device whenever anyone accesses your door with a matching Goji key, keeping records of your family’s comings and goings. (In other words, the kids will never be able to successfully sneak out to late-night parties.) The locks are compatible with most metal or wood doors equipped with deadbolts. Though Goji is still in the process of fulfilling pre-orders, the company expects orders placed now to arrive in February 2014. Similar products, such as August, are already on the market.Pre-order price: $245. The possibilities are endless with Spotter, the all-in-one sensor for your home. Spotter monitors light, temperature, sound, humidity, motion and more, and notifies you about a number of activities in your home — when your laundry is finished, or when the kids come home from school, for example. The device connects wirelessly to your mobile device, so you receive push notifications or alerts according to your settings. The highly customizable Spotter is available at Quirky.com and The Home Depot. Price: $49.99. SmartThings lets you actually run your home with your smartphone, giving you the ability to fully automate your electronics, appliances and lighting, as well as monitor valuables, people and pets. Lock and unlock doors from anywhere, turn on the lights before you get home, find your keys and even connect your home appliances to social networks (turn on a light when you’re tagged in a Facebook status, for example). The mobile app is available for both iOS and Android. Choose the “Know Your Home” kit, which focuses on home monitoring, or the “Know & Control Your Home” option, which allows complete automation. Price: $199 and $299, respectively. Singing in the shower has never been so high tech. Wirelessly pair your devices with the Moxie showerhead and wireless speaker to enjoy the tunes you love during shower time. These cool showerheads come in five colors: navy blue, chartreuse, retro blue, cherry red and original white. The speakers are magnetic, and conveniently pop in and out of the showerhead for easy recharging. Price: $199. The Apex AquaController system is a must-have for serious aquarists. Once this system is integrated with your tank and fully set up, you can wirelessly monitor your aquarium’s activity and salinity, adjust lighting and even feed your fish remotely from your smartphone. Price: Full systems start at $219. This smart baby monitor is a great gift for new parents. The device utilizes high-resolution video quality and even night vision to alert you the second your baby is up and moving, crying or in distress, so you’re connected to your little one day and night. You can talk or sing to baby directly from the monitor, even if you’re out to dinner and the babysitter’s on duty. Price: $249.99.